If you’re a keen home cook or aspiring professional chef, a really good-quality set of kitchen knives can really improve your results in the kitchen! A top-rated kitchen knife set will equip you with the right tool for every slicing and dicing task that you undertake. Investing in a good set of kitchen knives will make food preparation a pleasurable breeze; and should last you a lifetime too! However, there are so many different styles of high end kitchen knives available, knowing which to choose can be extremely confusing! To help you make an informed decision, we’ve compiled a list of the best kitchen knife sets 2018 and the best kitchen knife sets 2017 to help you make the best choice for your needs. All the kitchen knives sets we’ve reviewed in this guide can be great options, whether or not you are cooking Paleo or any other type of popular cuisine. But before we present our top kitchen knives set reviews, here’s our comprehensive buyer’s guide to kitchen knives. Rather than buying individual kitchen knives and ending up with a mix and match collection of cutlery, you will probably find it more cost-effective to purchase a custom-made set that comes complete with a storage block. Before you start searching for the best kitchen knife sets, it’s important to have a clear idea of what’s out there and what you are likely to need. Although there is a huge range of kitchen knives to choose from, most home cooks really only need five basic styles for everyday use: a paring knife, a chef’s knife, a serrated knife, a bread knife, and a carving knife. This selection of best kitchen knives will cover most of your daily cutting and carving tasks in the home kitchen. However, if you like to experiment with different foods and specific, more specialist food preparation tasks, you may need a wider selection of kitchen knives. Paring knife: A paring knife is a small, handy blade that is used for prepping small items of vegetables and fruit. Chef’s or Cook’s knife: This is a wide blade that is used for chopping and slicing a variety of foodstuffs, from chicken breasts and cold meats to vegetables. The blade of a best quality chef’s knife should be slightly curved to provide a rocking motion as it cuts. The chef’s knife is a very versatile tool, and as such is the one that you will probably use more than any other. Finely Serrated knife: This knife is useful for slicing soft vegetables and fruit. Always use a serrated blade for slicing items such as tomatoes, as a smooth blade may slip and cause injury. Bread knife: The serrated bread knife is designed specifically to cut slices of bread cleanly without tearing it. Carving knife: A decent carving knife should have a blade measuring approximately 8 inches to 10 inches. The blade should be flexible and have a sharply pointed tip for helping to loosen meat from the bone. This is important when carving different types of meat – not so much when trying to cut smaller items (we don’t mean rice). Cleaver: A cleaver has a distinctive, large rectangular blade and is used for chopping through boned joints of meat. This kind of knife is not generally included in standard knife blocks and is usually only used by professional chefs who undertake their own butchery work. Boning knife: A boning knife has a very long, thin flexible blade and is used for de-boning meat. Filleting knife: This knife has a slim blade and a straight cutting edge. The blade’s flexibility makes it ideal for cleanly and efficiently filleting and skinning meat and fish. Santoku: A Santoku is a Japanese-style chef’s knife that has gained rapidly in popularity over the past few years. The Santoku has a curved end, rather than a pointed one, making it ideal for the chopping and slicing tasks that are integral to Asian cuisine. Some Santoku knives are made with scalloping or dimpling ground into the blade so allow air to move between the blade and the food. This feature is important in preventing slices of food from sticking together, allowing them to fall away instead. In the world of kitchen knives, the saying “you get what you pay for” is certainly true, especially when looking at high end chef knives. In the long run, it’s always best to buy the very highest quality knives that your budget will stretch to, as these will last you longer and perform better. Stainless steel: The majority of kitchen knives that are available today are made from low-carbon stainless steel. Stainless steel is popular due its anti-corrosion qualities, although it does need more frequent sharpening than other materials in order to keep the cutting edge sharp. Standard stainless steel tends to be the material of choice that is used in the manufacture of cheaper kitchen knife sets, although price doesn’t necessarily mean that the quality of the product is inferior. Carbon steel: Carbon steel is the kitchen knife material of choice for professionals. Although it is usually more expensive than standard stainless steel, it contains a higher proportion of carbon, meaning that your blades will retain their sharpness for longer and will also be harder wearing. Carbon steel is very rust and corrosion resistant and produces a consistently sharp blade, even after repeated sharpenings. Investing in a kitchen knives set made from carbon steel should mean that you never need to replace them and they should give efficient service for their lifetime. Ceramic: Ceramic blades are fabricated using high-purity zirconium oxide, making them extremely lightweight and as hard as diamond. Ceramic blades retain their sharp edge for much longer than stainless steel. Ceramic does not rust or corrode as a metal blade might. However, ceramic knife blades do tend to inflict considerable damage on wooden chopping boards and you cannot use them in a twisting motion that would be necessary for some tasks. Ceramic is not flexible and twisting the knives will cause small chips to come off. Although the knives can be sharpened, the process is time consuming and laborious due to the hardness of the ceramic material, and it is also difficult to eradicate any chipping that has occurred. Damascus steel: A Damascus blade is made from a laminated combination of layered carbon steel and stainless steel. This formulation gives the blade a very hard edge, which can be ground until it is super-sharp. The blades have a characteristic marbled appearance. Knives with Damascus blades are usually manufactured to extremely high standards in Japan. For this reason, they tend to be much more expensive than knives made from stainless steel or carbon steel and are generally used by high-end professional chefs. Titanium: Titanium is generally used in combination with ceramic or silver, creating an extremely durable and lightweight knife. This material does not rust and is virtually impossible to break, even if dropped onto a tiled floor from a great height! However, titanium’s extreme strength is also its downfall when it comes to its use in making kitchen knives. As the material virtually indestructible, it is also extremely difficult to sharpen. A standard knife steel simply will not do the job, and you will need to send your titanium knives away to a professional company to have them re-honed. There are a number of important design features to look out for when buying kitchen knives. Serrated or plain blades: A blade with a plain edge will need sharpening regularly to keep it keen. By comparison, a serrated blade will remain pretty consistent throughout its useful life, as it can’t be sharpened. 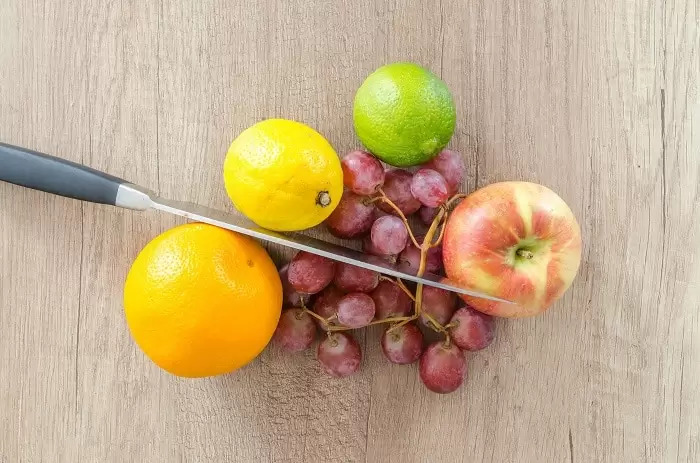 Serrated blades are also much easier and safer to use when slicing fruit and vegetables with smooth skins such as tomatoes, because the blade won’t slip or crush the food. Full tang: A full tang knife has a blade that extends right down the knife handle to the end. This gives the knife extra strength and superior balance and is something that you should always look out for if you want a top-spec kitchen tool. A k nife handle with rivets often indicates a full tang, although sometimes the rivets are just for show, so be sure to check the product specification for confirmation of this.Many cheaper knives have a half-tang, where the blade extends just half way down the handle. This can be problematic, as it can lead to the blade working loose over time. Choil or heel: The choil or heel is the term used to describe the bottom of the blade that is nearest to the knife handle. For safety reasons, the choil should be smooth and not pointed backwards, as this could injure your forefinger when you apply pressure to the knife. Bolster: The bolster is the part of the knife that sits between the handle and the blade. It is usually thicker than the rest of the blade in order to prevent your fingers from slipping forward and sustaining injury. However, bear in mind that a bolster that is too large will make it difficult to sharpen the full length of the blade. Some styles of kitchen knives such as Santoku do not have a bolster. Balance: It is important that the blade of the knife is evenly balanced. You can easily check this by placing the knife across your fingers. If the blade is well-balanced, the knife will stay level. Balance is an important consideration when choosing a chef’s knife, and we’ll look at this in more detail later in the guide. Weight: Note that professional chefs prefer a heavier knife. In addition, if the knife is very light, the materials it is made from could be of inferior quality. Choose a knife that feels comfortable in your fingers; neither too light nor too heavy. Handle: The knife should have a substantial handle to ensure that your grip remains secure while you are using it. Some knives are made with hollow, sand-filled handles. These are usually carefully weighted to ensure perfect balance during use, and they tend to be less tiring to use when undertaking long periods of food prepping. One-piece designs, where the knife handle is integral to the knife and forms a natural extension to the blade tend to be stronger and more long-lasting than knives that have an attached handle. In addition, single-piece designs do not have crevices or cracks where bacteria and dirt could become trapped. These designs are easier to clean and they also are less prone to breaking or bending where the handle meets the blade. Dishwasher safe: If you choose knives with wooden handles, it’s probable that they are not dishwasher-safe, while knives with plastic handles usually are. However, it’s worth bearing in mind that knives washed by hand usually stay sharper for longer. In addition, it should be noted that most product warranties do not cover knives that are washed in a dishwasher. Never leave your knives soaking in water, as this can encourage corrosion. Similarly, don’t leave knives in a dishwasher on a “pause” or “rinse-and-hold” program. Most sets of kitchen knives are sold in a custom-made knife block. 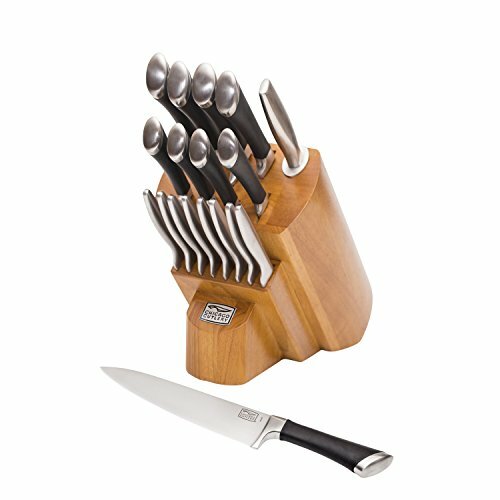 A knife block is essential for storing your knives safely and preventing them from being damaged. Knives that are stored loose in a drawer can easily become dulled and pitted from contact with other drawer contents, and using a knife block will prevent this. A knife block also removes the risk of you injuring yourself when rummaging through a drawer for the knife you want. If you have issues with manual dexterity, a knife block can make selecting the tool you want easier, as long as the knife handles are well-spaced out in the block. Knife blocks follow two general designs. Some are designed to completely sheath the knife blade within the block, leaving only the handle or bolster sticking out, whereas others allow the knives to hang down between two clear tempered glass or acrylic plates. 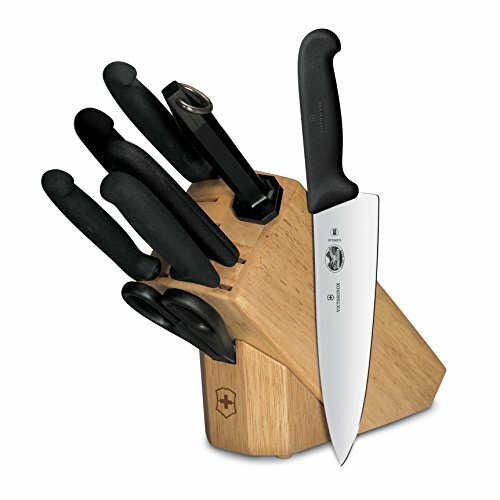 If you choose a knife block that conceals the blades, look for a design that includes labels on each knife, indicating which blade belongs to which handle. This simple feature can save you much frustration, allowing you to make your selections quickly and get it right first time! Also, be sure to choose a block that allows plenty of space between the knife handles for ease of use, especially if you have manual dexterity problems. The second option allows you to see the knife blade, making it quick and easy to select the right one, which is essential if you work in a busy kitchen. However, it’s best to choose a clear block that encloses the knife blades completely so that they are not exposed to kitchen steam and grease that could eventually damage or dull the blades. Additionally, airborne bacteria can quickly gather on exposed blades, presenting a hygiene issue. Some knife blocks are built with a convenient integral knife sharpener. Each time you withdraw or replace a knife, a ceramic sharpening tool within the knife block automatically sharpens the blade for you. This handy feature can save you a lot of time and labor and is also much safer to use than a sharpening stone or steel. A good-quality knife block should be heavy enough to keep it stable on a smooth kitchen work surface. Wooden or tempered glass knife blocks are the heaviest and usually include small rubber pads underneath to prevent the block from slipping. If you choose a “stand-alone”, empty knife block or one with spare knife slots, you can add to your collection of kitchen knives as and when you need to, without having to buy a whole new set just to include one additional piece. However, the usefulness of this relies on your chosen knives fitting the slots! As there are plenty of kitchen knife sets available that offer a wide and comprehensive choice of blades, it’s usually more practical to buy one of these. Rather than using a knife block, you could opt to store your kitchen knives on a magnetic strip attached to the wall or to the inside of a cupboard door. Although this would save counter space in a small kitchen and allows you to clearly see which blade is which, it is not an ideal storage solution. The knives will be left exposed to the steam and airborne grease in your kitchen environment, potentially leaving the blades vulnerable to corrosion and trapping bacteria. To be sure that you knives were clean and hygienic before using them to cut food, you would need to wash and dry each one! We’ve compiled this list of kitchen knife sets reviews to help you choose the best one for your needs. All these kitchen knives can be viewed and purchased through Amazon.com or other major online retailers. Mercer Cutlery provide high-quality kitchen knives to many cooking academies and are the choice of many professional chefs. The Genesis collection of kitchen knives is designed for comfort, efficient cutting, and durability.The knives are forged from single-piece, high-carbon, no-stain German steel. Each knife has a substantial bolster to improve balance and safety, and all the blades are taper-ground and hand-polished. The handles are made from black, non-slip Santoprene for sure grip. The collection of kitchen knives is housed in a stylish, contemporary tempered glass block that’s designed to stand upright on your kitchen counter. The knives are displayed visibly but without exposed blades, making knife selection easy and keeping the blades clean and safe from accidental damage. The collection includes 3-1/2-inch paring, 5-inch utility, 8-inch chef’s, 8-inch bread, and 6-inch boning knives. The Genesis collection is warranted for one year. Note that the collection should only be washed by hand. The RH Forschner by Victorinox block knife set contains a 4-inch paring knife, 6-inch boning knife, 8-inch chef’s knife, 8-inch bread knife, 10-inch slicing knife, 10-inch sharpening steel, and kitchen shears. All the knives and the shears are housed in a stunning slant-style hardwood block.The high-carbon, stainless steel knife blades are hand finished in Switzerland. A special tempering process is employed to produce a blade edge than can be re-sharpened throughout its life, ensuring that the original sharpness is retained.The knife handles in this best cutlery set are ergonomically designed to provide a natural, comfortable fit and reduce wrist tension. The sure-grip handles have a finger guard to protect your fingers from injury if your hands are wet or greasy. The handles are also cleverly designed with minimal crevices that could harbor bacteria, improving the hygiene of the knives. The knives are dishwasher-safe, although the manufacturer does recommend hand-washing.This best knife set comes with a lifetime warranty against defects. Wusthof knives have been hand-crafted in Germany since 1814, and the superior quality and workmanship in every knife collection reflects this experience.The blades are precision-forged from durable stainless steel, featuring a full tang for strength and a bolster for added balance and weight. Unique Precision Edge Technology enhances the sharpness of the blades by 20%, and effectively doubles their lifespan, so you’ll only ever need to buy one knife set.The cutting edge of each blade is computer controlled for perfect precision and uniformity from the tip of the blade to the heel of the knife. The unique 14 degree dual-edge tapered cutting edge ensures reduced drag when slicing through food, producing effortless, seamless cutting every time.The knife handles are triple-riveted for strength and are made from extra-durable synthetic polyoxymethylene for fade and discoloration resistance. 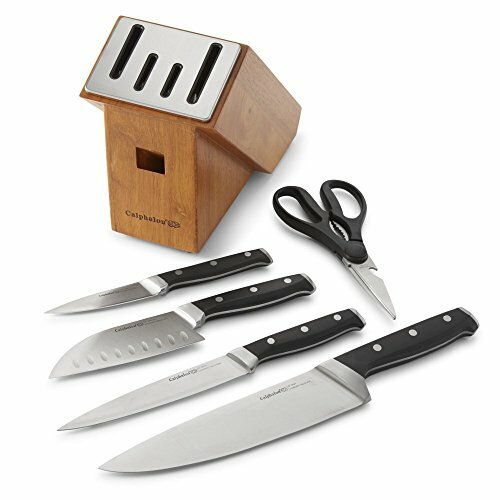 The Wusthof Classic knife set contains includes 3.5-inch paring knife, 5-inch serrated utility knife, 6-inch Kiritsuke prep knife, 8-inch bread knife, 8-inch chef’s knife, and handy come-apart kitchen shears.The knives are housed in an attractive cherry wood 6-slot knife block. The block’s ultra-slim design allows you to maximize your kitchen counter space.The knife set comes with a lifetime guarantee. 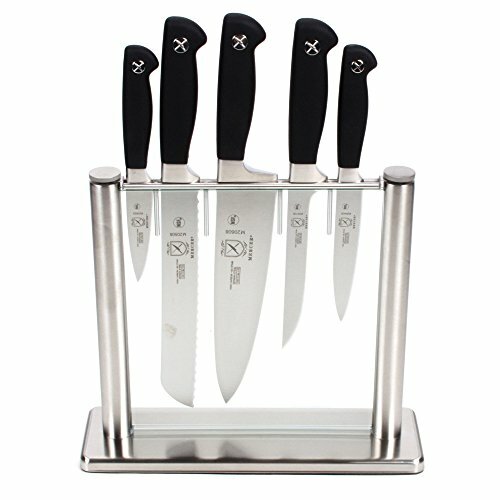 Global knives are used by professional chefs worldwide, and are also a great choice for the home cook who’s serious about their culinary craft.The Global kitchen knife block set is a 6 piece combo, comprising 7-inch Asian cook’s knife, 8.25-inch carving knife, 8.75-inch bread knife, 5.25-inch utility knife, and a 4-inch paring knife. The knives are stored in an attractive stainless steel counter top block.The knife blades are thin and razor sharp, providing zero drag and easy slicing through any foodstuff. Rather than the usual western style beveled edge, Global knives are precision-ground to a straight point. The CROMOVA 18 stainless steel that is used to make Global knife blades is a forged from a blend of 18% chromium for excellent stain resistance, plus vanadium and molybdenum for longer edge retention.Superior knife balance is provided via a trademark, sand-filled hollow handle design. The stainless steel knife handles are molded for comfort and feature a unique darkened dimple texture to give a non-slip grip. The knives are lightweight and comfortable to use, making them perfect for you if you have manual dexterity issues or if you work in an environment where you are prepping food for long periods of time.The smooth, seamless stainless steel construction of the knives completely eliminates dirt and food traps, ensuring good hygiene in making cleaning the knives easier and more effective. The Henckels International Statement knife block set is packed with all the tools you will ever need to efficiently and easily tackle your kitchen tasks and offers one of the best sets of kitchen knives for the money. 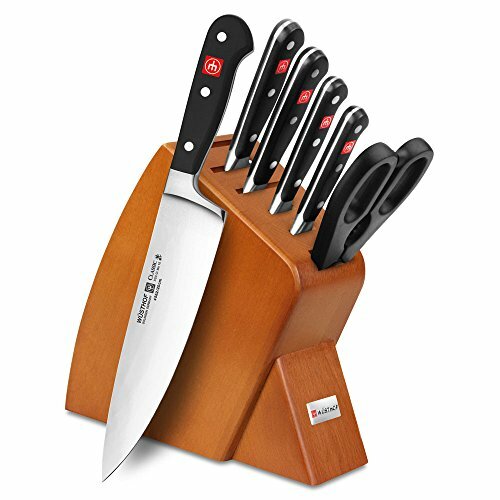 The kitchen knife set includes a 3-inch paring knife, 5-inch serrated utility knife, 7-inch Santoku knife hollow edge, 8-inch chef’s knife, 8-inch bread knife, 6 – 4.5-inch steak knife, sharpening steel, and kitchen shears. The knives are all housed in an attractive hardwood block. The fine-edge, satin-finished knife blades are honed for durability and super-sharpness, using precision cutting technology to ensure easy and seamless cutting every time. Made from hygienic, high-quality stainless steel, the blades’ single-piece stamped construction makes these knives comfortably lightweight. Each knife has a full tang and triple rivet handles for strength and durability. The handles are curved for improved comfort and feature a stainless steel endcap for style and balance. Deik’s high-quality kitchen knife blades are made only from high carbon content stainless steel for super-sharp, precision cutting and longevity. The material also resists stains and rust, so you’ll only ever need to buy once!The knives are forged from one single piece of material so that the blade will never come loose from the handle. The clever design also means that there are no crevices or fissures that could accumulate dirt or harbor bacteria. A smart hollow handle design delivers excellent weight and balance to prevent your hand from becoming strained during long periods of food preparation. A knife sharpener is included with the set.The knife set is presented in an enclosed acrylic block, which will keep the blades clean and in pristine condition. The knife handles are tapered and curved so that they fit perfectly into your hand for comfort and optimal control during use, regardless of whether you’re slicing, dicing, mincing, cutting or chopping.This German-made knife set comes with a lifetime warranty. 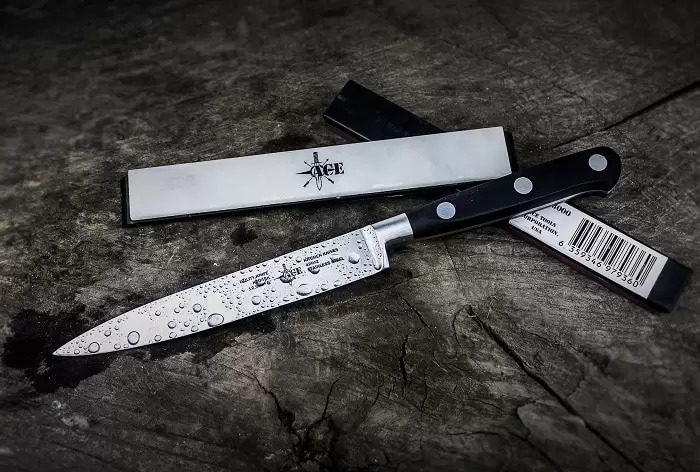 The set contains an 8-inch chef’s knife, 8-inch carving knife, 8-inch bread knife, 7.5-inch stainless sharpening steel, 7.5-inch shears, 5-inch utility knife, 4.5-inch steak knife (x 6), and a 3.5-inch paring knife. This newly designed Cuisinart kitchen knife set is made from superior high carbon stainless steel for longevity and stain resistance. The knives are designed with strong, durable bolsters to give the knives stability and control while you are using them. The one-piece design ensures that there are no cracks or crevices where the handle joins the knife blade, which could harbor bacteria or trap dirt. The knife handles are hollow, making the knives well-balanced and comfortable to use, even during long sessions of food prepping. 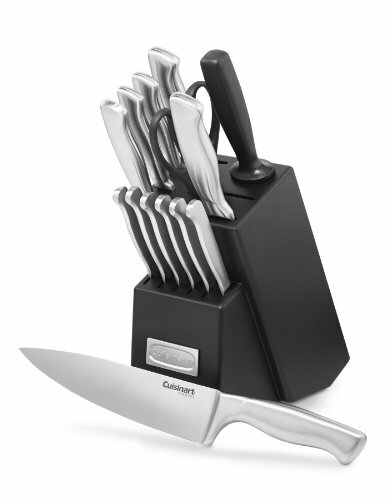 Each blade is designed to be easy to clean, and they are all precision-tapered to gradually narrow into an extremely sharp, fine edge, ensuring easy, smooth cutting with no annoying dragging or tearing.The Cuisinart knife set is presented in a smart black acrylic block and comes complete with a useful sharpening tool. This set includes an 8-inch chef’s knife, 8-inch slicing knife, 7-inch Santoku knife, 5.5-inch serrated utility knife, 3.5-inch paring knife, 3.5-inch bird’s beak paring knife, 8-inch sharpening steel, and all-purpose household shears. The set comes with six 4.5-inch hot-forged steak knives you will be proud to use at your table.The whole is set comes with a lifetime warranty. 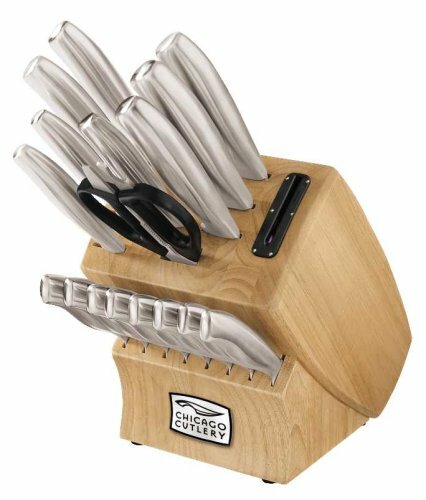 The Chicago Cutlery Fusion kitchen knife set boasts no less than 18 pieces, making this set excellent value for money. Although these knives are not as expensive as other comparable sets, you can still enjoy the experience of a professional chef thanks to their quality and craftsmanship. The knife blades are made from forged high-carbon stainless steel for incredible sharpness and longevity and are one of the sharpest kitchen knife sets around. Chicago’s special taper grind edge technology ensures that every blade has a long-lasting edge. 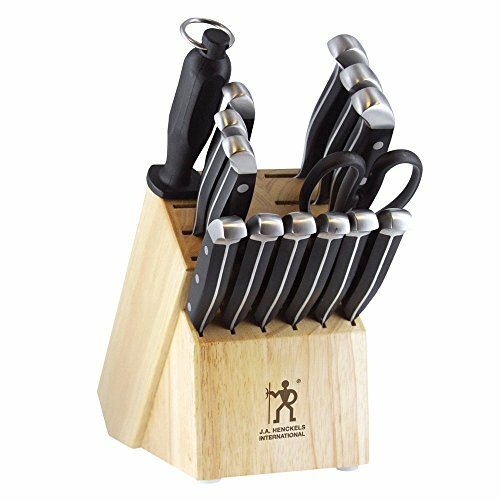 Soft, comfort grip poly handles provide you with perfect balance and control, even when your hands are wet or greasy.This kitchen knife set is presented in an attractive stained pine wood block that will grace any countertop. The set contains a 3-inch peeling knife, 5-inch utility knife, 7.75-inch chef’s knife, 8-inch slicer, 7.75-inch bread knife, 5-inch Partoku knife, 7-inch Santoku knife, 3.25-inch paring knife, 8 x 4.25-inch steak knives, and an 8-inch sharpening steel.Chicago Cutlery offer a limited lifetime warranty with this product. However, it should be noted that the knives are hand-wash only. The Calphalon Classic Self-Sharpening Cutlery set contains an impressive 15 individual pieces, making it a perfect, versatile set for keen home cooks. This is one of the best kitchen knife sets for the money that we found. The attractive blonde rubber-wood knife block has integral ceramic knife sharpeners that sharpen the straight edge knife blades every time you remove or replace them, saving you time and effort and allowing you to focus instead on cooking great food! The knife blades in this good kitchen knife set are built to last, being made from forged high-carbon stainless steel to give maximum resistance from rust and pitting.Each of the sturdy knife handles is triple-riveted to give a reliable grip and improved longevity. Full tang construction guarantees excellent strength and the curved design fits easily into your hand for comfortable grip, even during long food prepping sessions. For ease of blade identification, each handle is clearly labeled. Calphalon provide a full lifetime warranty with this knife set.The set includes a 4-1/2-inch paring knife, 6-inch utility knife, 6-inch serrated utility knife, 7-inch Santoku, 8-inch, chef’s knife, kitchen shears, and 8 x stamped steel steak knives. The Chicago Cutlery 18 piece Insignia kitchen knife set offers a comprehensive range of kitchen knives for use by serious home chefs.The set of high quality kitchen knives contains a 3-inch peeler, 3-1/4-inch paring knife, 6-inch boning knife, 5-inch utility knife, 8-inch serrated bread knife, 7-inch Santoku knife, 8-inch slicer, 8-inch chef’s knife, kitchen shears, and 8 x 4-1/2-inch steak knives. The knives are housed in an attractive solid wood block with a handy in-block sharpener.The knife blades are fabricated from professional-grade forged high-carbon stainless steel, tapering to integral stainless steel handles, which are contoured for comfort and ease of use. Chicago Cutlery’s exclusive taper grind edge technology ensures that each blade gives maximum sharpness to ensure precise, seamless cutting with no snagging or tearing.The forged design gives the knives better balance and increased weight for stability and ease of use. High-carbon stainless steel is renowned for its ability to resist rust, pitting, and staining, ensuring that your kitchen knife set will last you a lifetime. The full metal tang extends from the knife tip into the handle, providing superior strength, control, and balance. A forged bolster prevents wet or greasy fingers from running onto the blade.To keep the knives in superb condition, they should be hand-washed.Chicago Cutlery offer a lifetime warranty on this top-quality product. A custom-made set of kitchen knives is the most cost-effective way to buy kitchen knives. Choose kitchen knives that best suit your regular cooking style. Always store your kitchen knives in a block so that they don’t become damaged amid clutter in a drawer. Kitchen knives should feel well-balanced and comfortable in your hand, especially if you undertake long sessions of repetitive food preparation tasks. Kitchen knives with an integral handle design are easier to keep clean and are less likely to trap dirt and bacteria. Manufacturers of the best professional chef knife sets always offer a lifetime warranty, illustrating how confident they are in their product. In the world of the best kitchen knife sets, paying a little more usually ensures that you will get the best quality kitchen knives. « Lemon Oreo Truffles: Delicious and Easy to Make!